By default the Raspberry Pi 2 is configured to output console data on UART0. This is helpful for debugging a headless target, but renders the UART unusable by LabVIEW. Enabling the UART will disable console output and make the UART usable by LabVIEW. During the software installation process the LINX Target Configuration Wizard will display a warning if the Raspberry Pi has the serial console enabled. 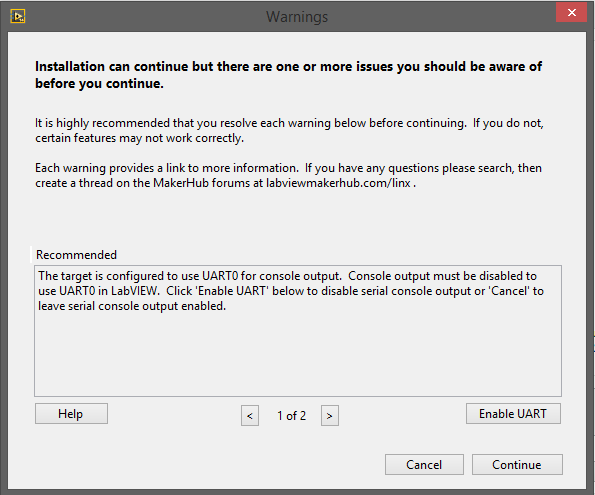 Clicking Enable UART will disable the serial console and enable UART support in LabVIEW.